Two months ago we developed the training course of our project in Gran Canaria (Spain). 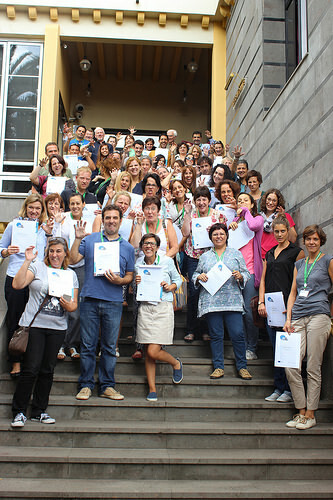 During one week a group of teachers from different European countries got together in a little island near Africa, with the purpose of learning a new methodology to teach CLIL. It was an intense week. The people from the project had a lot of work to do and the weeks before the course were hectic, let alone the week for the course itself. However, there is a memory that eclipses all the frenzy and the stress. It’s the memory of seeing the teachers participating in the course. The members of the project team decided to go further beyond just organizing and teaching, and took an active role together with the participants. We mingled with them, played with them and learnt with them. We were also parts in the towers created, characters in the tales invented, animals in the forests imagined . We danced with them, sang with them, played with them. We sat together and reflected upon the games. We tried to understand when, where and how to use the games. We shared our questions, our doubts and our criticisms. And we even did a bit more than that: We had dinner together. We went on an excursion together. We shared the bits of time during breakfast and lunch to keep talking about what we were experiencing. But overall, we enjoyed learning together, in a nice atmosphere where we were all willing to try something new out of the generosity of taking part in the course to the full.